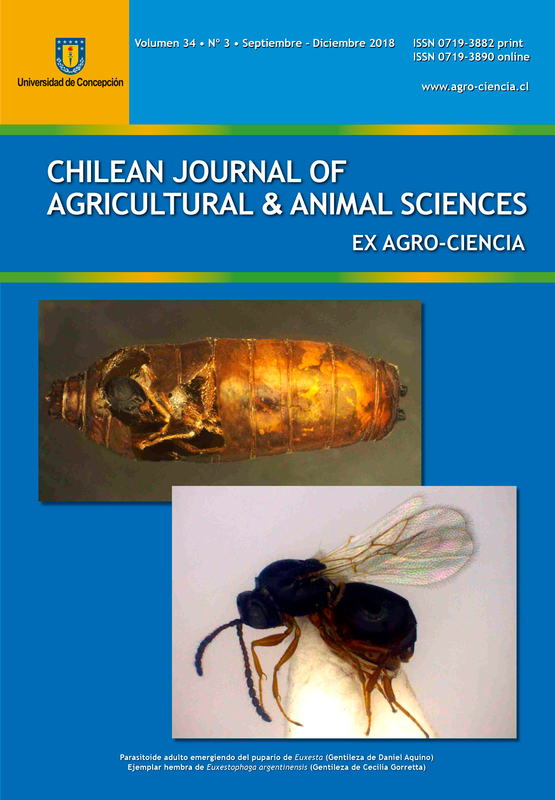 Effect of Euxestophaga argentinensis (Hymenoptera, Figitidae) on corn-silk fly larvae Euxesta sp. in two sweet corn planting dates. Euxesta sp. (corn-silk fly) is a highly polyphagous insect genus that affects horticultural crops, fruit trees, and industrial crops. It causes huge economic losses in sweet corn (maize). Damage is caused by larvae feeding on corn silk, kernels and the remainder of the cob. Chemical treatments applied to maize crops are often not effective; therefore, efforts to control the fly must focus on finding alternative methods, such as biological control. The aim of this work was to determine the effects of Euxestophaga argentinensis (Hymenoptera, Figitidae) parasitism on corn-silk fly larvae, in two different planting dates: late winter and late summer. Samples were taken during spring and autumn in a commercial Bt sweet corn for two consecutive years. A total of 20 ears of corn per simple were collected at random and were placed in plastic trays, stored at 22 ± 2°C and 70 ± 5% RH and exposed to a 14:10 h photoperiod. Euxesta eluta and Euxesta mazorca pupae were separated, placed in separate plastic vials and periodically checked for emergence of adult flies and parasitoids. E. eluta has greater potential to damage sweet corn crops than E. mazorca. Parasitism was higher in late winter than in late summer, while only E. eluta was parasitized. Key words: Euxesta sp., maize, parasitoid, biological control. * Correspondence author E-mail: isabelb@fca.unl.edu.ar.